Grammar Lessons - Prepositions of Place and Time. "We jumped in the lake"
"Many shops don't open on Sundays." 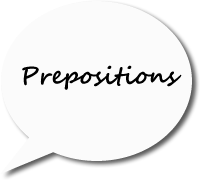 Generally speaking one can classify prepositions in three groups: prepositions of time,prepositions of place and other types of prepositions. Visit the pages below to study each type. We provide explanations along with some examples.